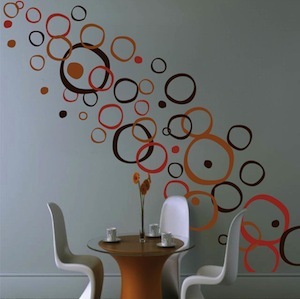 24"x12" sheet includes 21 rings ranging from 2"-12"
Interior wall design becomes your own art project with the Modern Rings Wall Decals. 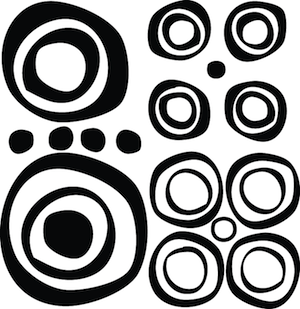 Each pack includes 21 rings and 6 dots ranging from 2" to 12". To get multiple color arrangements, place multiple orders of the design in the colors of your choice and really mix it up! 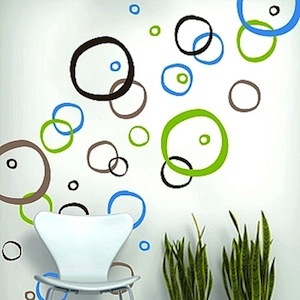 All wall decals are made from 100% interior safe, removable vinyl, available in over 40 colors and multiple sizes, that appear painted right on the walls! Perfect for permanent or temporary decorating! Great on windows and smooth surfaces of nearly any kind! Sizes within a close approximation. I PUT THE MODERN RINGS WALL DECALS IN FOUR DIFFERENT COLORS ON MY WASHER AND DRYER, AND I LOVE, LOVE, LOVE THEM. I COMPLETELY RE-DID MY LAUNDRY ROOM AFTER I GOT THE DECALS, PAINTING THE WALLS LIME GREEN TO MATCH ONE OF THE DECAL COLORS AND IT'S SO BRIGHT AND CHEERFUL IN THERE NOW! THE DECALS ARE HIGH-QUALITY AND IF YOU TAKE YOUR TIME, THEY ADHERE PERFECTLY. I just loved my decals, they are on the wall just behind my bed and I used this as an accent wall; they look fabulous. I wanted one of the walls to have a unique look and the decals did just that, thanks!